A new book exploring the field of cyberformance – live performance events that connect remote participants via the internet – offers a variety of perspectives on this multi-disciplinary live art form. CyPosium – the book has been edited by Annie Abrahams and Helen Varley Jamieson. Its contributors are Adriene Jenik, Alan Sondheim, Alberto Vazquez, Annie Abrahams, Auriea Harvey and Michaël Samyn, Cherry Truluck, Clara Gomes, Helen Varley Jamieson, James Cunningham, Joseph DeLappe, Liz Bryce, Maria Chatzichristodoulou, Maja Delak and Luka Prinčič, Miljana Perić, Rob Myers, Roger Mills, Ruth Catlow, Stephen A. Schrum and Suzon Fuks. CyPosium – the book is published by Link Editions, in partnership with La Panacée, Montpellier, as part of “Open”, a series of catalogues, essay collections and pamphlets co-published with partner institutions. It is available as a print-on-demand paperback, e-book and downloadable PDF. CyPosium – the book presents selected material from the CyPosium, a one-day online symposium organised in October 2012 to discuss cyberformance. Artists from a range of backgrounds have experimented in this field for as long as they have had access to the internet, and the CyPosium sought to remember and celebrate some of this ephemeral and pioneering work.The 12-hour event consisted of online presentations and facilitated discussions, and attracted an audience from around the world who engaged in a lively, vibrant real-time conversation. 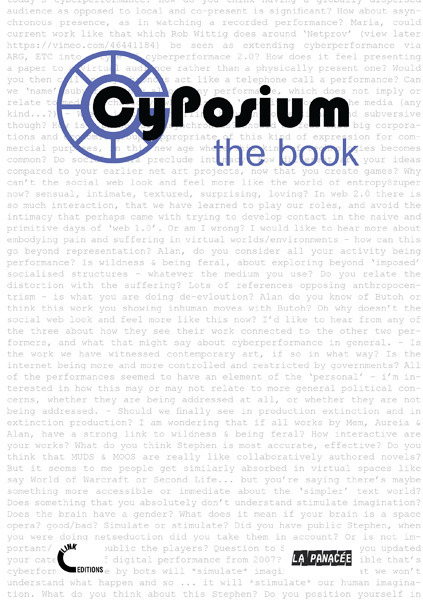 CyPosium – the book continues and expands on this discussion by presenting texts, chat log excerpts, discussion transcripts, edited email conversations, creative chat excerpt essays and illustrations from the event, along with responses to the event. CyPosium – the book will be of interest to practitioners, students and researchers of digital and online arts. While its focus is live performance, the contributors hail from a wide range of practice both online and offline, and their writing illustrates the hybrid nature of contemporary arts involving digital technologies. Music, dance, poetry, sound art and the visual arts all feature, as well as entertainment and social practices such as computer games, virtual worlds and online dating. Common themes that emerged during the CyPosium are also present in the book, such as the changing role of the audience; intimacy in the online environment; and mortality. This breadth of form and content reflects the ever-increasing ubiquity of the internet and digital technologies in our daily lives as well as our arts practices.